Valero Energy stock has returned over 200% to investors in the last five years. Here are three reasons it could continue to rise. The nation's largest independent refiner is benefiting from the decline in oil prices and a rather timely completion of past capital investments that increased efficiency and capacity at several facilities. Sure, the short-term boost is good news for shareholders, but there are more sustainable reasons for Valero Energy stock to rise in the near and long term. Valero Energy Partners LP (NYSE:VLP) has been on an absolute tear since its IPO in late 2013, returning over 85% to shareholders through unit gains and distributions. The master limited partnership, or MLP, serves as an asset-holding portfolio for Valero Energy, which owns 100% of the general partner interest and roughly 70% of the limited partner interests. Due to MLPs' unique tax structure, Valero Energy Partners can generate more profit from the same assets than Valero Energy could on its own. Given its larger ownership stake, the company can strategically move assets to Valero Energy Partners and capture outsized profits -- a move that benefits the stocks and shareholders of each company. Indeed, the company plans on moving over $1 billion in assets to the MLP in 2015. That's absolutely incredible considering that Valero Energy Partners ended 2014 with a market cap of $3 billion and just $600 million in total assets, which included $245 million in current assets such as cash and receivables. Considering the youthfulness of Valero Energy Partners, investors could be in for a long ride of growth. 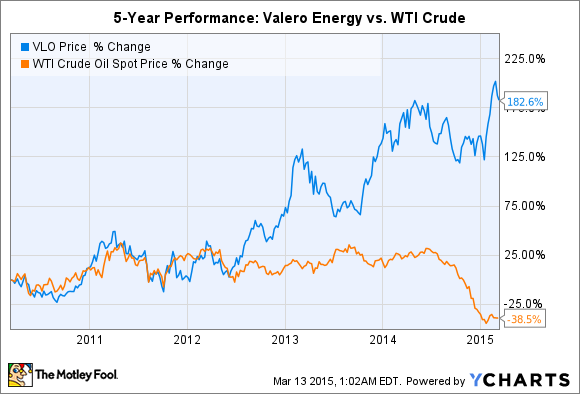 As noted above, Valero Energy is one of the few energy companies benefiting from lower oil prices. But that's only half of the story. While cheaper petroleum results in lower production costs, that doesn't mean anything if the products manufactured at the other end of the refinery sell for substantially less, too, and result in the same margins as before. This is often the case (it's the reason diesel fuel costs less when petroleum prices fall), although investors are often quick to forget. That's why investors should focus on more impactful trends and metrics, such as the price difference between Brent crude and WTI crude, also known as the Brent-WTI spread. A positive number means WTI is cheaper, while a negative number means Brent is cheaper. While both benchmarks have fallen after OPEC's decision late last year to maintain its supply level, the Brent-WTI spread has begun to rise to levels last seen during the Golden Age of American Refining, more commonly referred to as the period between 2011 and 2014. 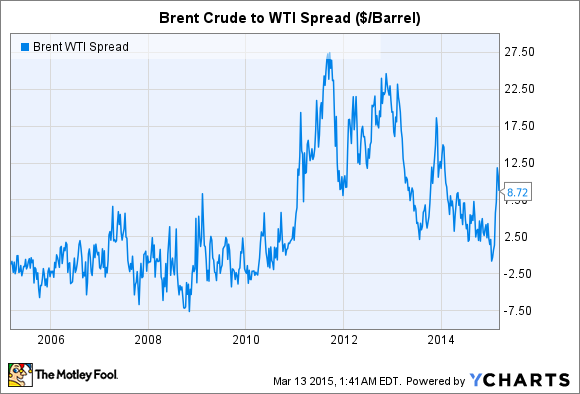 Why does the Brent-WTI spread matter? When positive (as it is now), Valero Energy can purchase lower-cost WTI in North America, refine it on the cheap into value-added petrochemicals, and sell them into markets that use higher-cost Brent to make the same petrochemicals. The selling prices are the same, but Valero realizes healthier margins than its peers that use more expensive inputs. Valero Energy management has been very disciplined in its use of capital, which is a great trait for investors to look for. This might be overlooked when times are good (as they have been in the last several years), but when belts need to be tightened the market runs to the safety of companies with efficient capital management. Simply put, they'll be less likely to make difficult and potentially growth-stunting decisions. Source: SEC filings, Valero Energy press release. While much of the decrease will come from declining investments in turnaround and growth, it's worth noting that the $2.8 billion spent in 2014 was actually $200 million below original guidance -- that's a good thing. A growth project not reflected in the guidance above could certainly appear, but being responsible with financials now provides the flexibility needed to pull the potential trigger later. Several positive catalysts point the way to higher stock prices for Valero Energy in both the near and long term. It's important to remember, however, that commodity markets are volatile and influenced by global variables. Therefore, even if you take the long view, it's always best to acknowledge the risks associated with an investment, too. We'll cover a few in the next article.